Good news! 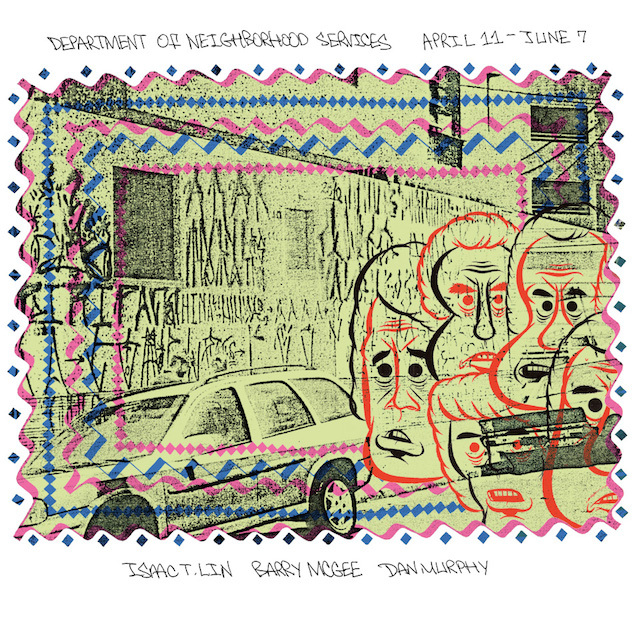 One international superstar and two great Philadelphia mainstays are showing together in Philadelphia starting next week at the Department of Neighborhood Services show at Fleisher/Ollman Gallery. Barry McGee is of course Barry “TWIST” McGee. Dan Murphy is half of Megawords and Vandalog readers may know him as a key member of Steve Powers’ ICY Signs company. Isaac Lin used to be at Philadelphia’s famous Space 1026 and graffiti nerds around the world may know him for his involvement with the DFW zines (which Dan Murphy has also been involved in). These three artists have shown together before and Murphy and Lin are regulars in the Philadelphia art scene, but I don’t think McGee has not shown in Philadelphia since the Indelible Market show at the ICA Philadelphia in 2000. That McGee should return to Philadelphia with this show and at Fleisher/Ollman is fitting, since Indelible Market was curated by Alex Baker, who is now the director of Fleisher/Ollman, and also included three artists with one foot in the art world and one foot in graffiti: McGee, Todd James and Steve Powers. If the name of that show and the artist line up sounds familiar, it’s because Indelible Market was the first in a series of historic installations including the same trio that have taken place in spaces including Deitch Projects and the Museum of Contemporary Art Los Angeles (the others being called Street Market and Street, with Street also including Murphy and others). Is it too much to hope that Baker can strike gold again? Maybe that’s asking too much and expecting too little. Not every show that Baker does in this format has to be historic to be interesting, and it’s unfair to let one show define his curatorial/directorial career. Still, I’m really looking forward to Department of Neighborhood Services. At the very least it’s three really interesting artists, including one who hasn’t show in Philadelphia in far too long. Philly, don’t miss this thing. Department of Neighborhood Services opens on Friday, April 11th from 6-8pm and runs through June 7th at Fleisher/Ollman Gallery. 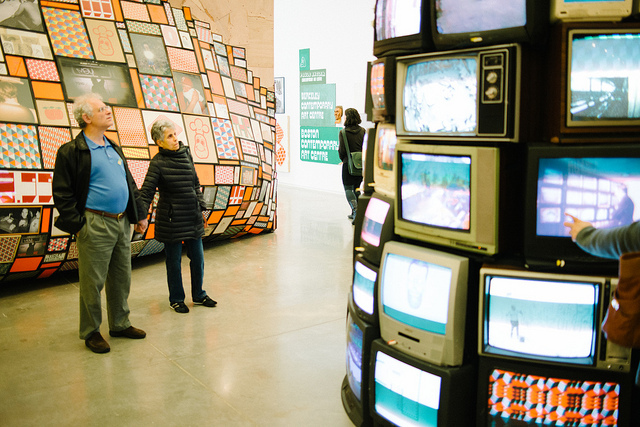 Earlier this month, I visited the Institute of Contemporary Art/Boston for the opening of Barry McGee, a retrospective of McGee’s work that had come to Boston after first being shown last summer in Berkley, California at the Berkeley Art Museum and Pacific Film Archive. 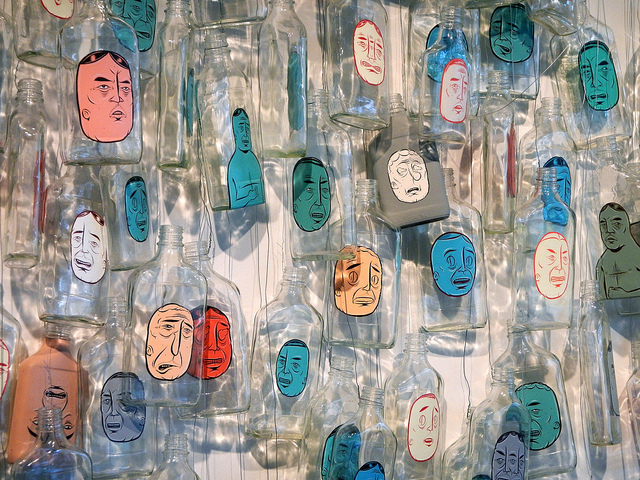 Barry McGee is a mid-career retrospective and the most extensive museum exhibition of McGee’s career to date. This version of Barry McGee is somewhat smaller than the version in Berkley, and so a few large works are not included, but this version also included a few pieces that were not seen at Berkley, more specifically work by Boston artists and graffiti writers and a bit of new work by McGee. 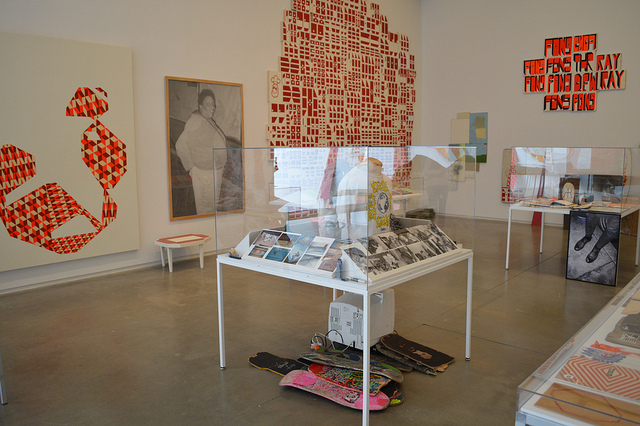 Since the exhibition is a retrospective, Barry McGee includes sculptures, paintings, drawings, zines, ephemera, etchings and video works by McGee from the early 1990’s all the way through to 2012, although even the old work is not quite the same as it once was because McGee likes to rearrange his old work into new configurations and shapes whenever possible. In addition to work by McGee, there were artworks and ephemera by about a dozen other artists whom McGee included in the show. 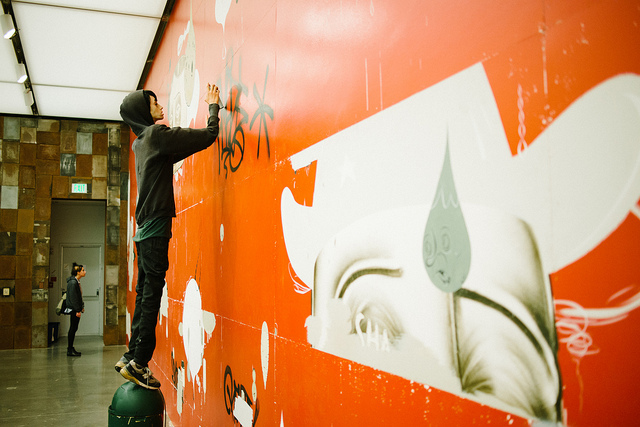 It is not quite an official part of the show, ICA adjunct curator Pedro Alonzo also arranged for McGee to paint a mural on the back of Boston’s House of Blues theater. 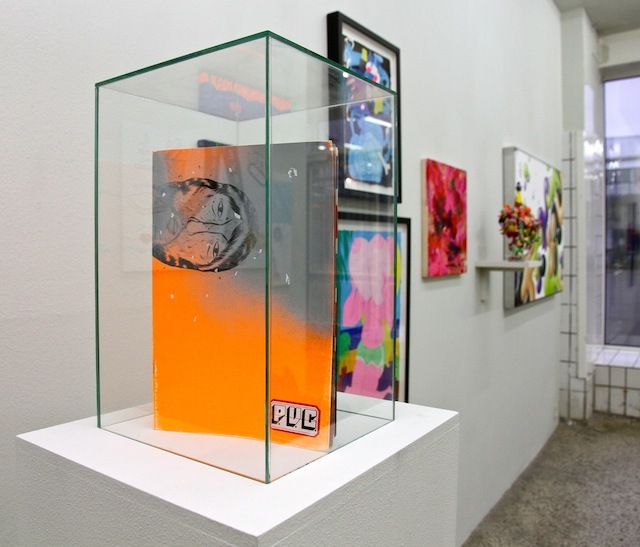 Despite the title, the show seems to be an effort by McGee to take advantage of his position as a “museum-ready artist” by bringing the work of his friends into the museum galleries too and to highlight the significance of the kind of graffiti that many people find ugly and undesirable. 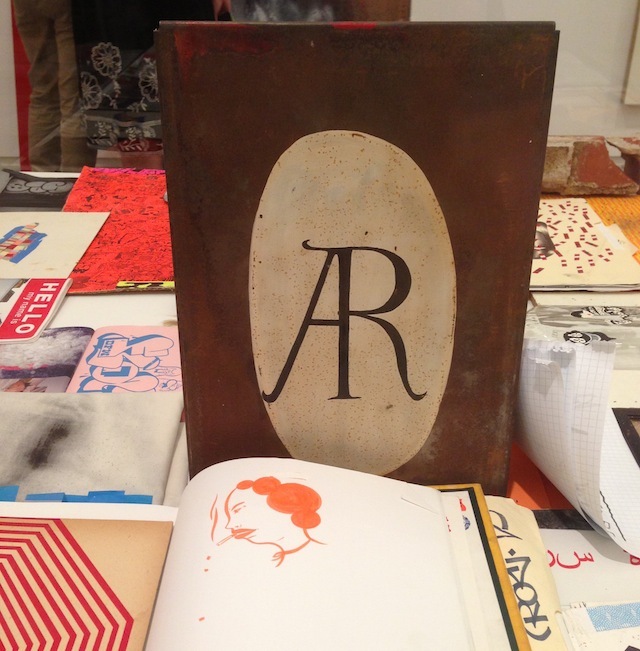 In Ben Valentine’s review on Hyperallergic of the Berkley version of Barry McGee, Valentine completely missed the mark and misunderstood McGee’s work and what was going on in the show. Valentine repeatedly refers to McGee as a “street artist” or his work as “street art”, a mistake that was made in some of the Boston press as well, perhaps because street artist is a more institutionally acceptable term than the much more accurate “graffiti artist” or “graffiti writer”. Valentine also claimed that there were sculptures all around the show of McGee tagging walls, and suggested that this might be some sort of mid-life crisis/street-cred proving move by McGee to show that he is still authentic. In fact, practically the opposite is true. Those sculptures actually depict McGee’s assistant Josh Lozcano and help to point out that McGee is older and that he is not longer as directly as involved in the culture he grew up in as he might like to be, whereas Lozcano is from a slightly younger generation and continued on as an active and accomplished writer long after McGee went into his current stage of semi-retirement. Similarly, at the opening at the ICA I heard multiple people asking docents what the letters “THR,” “CBT,” or “DFW” stood for or meant (the letters appear throughout much of the work in the show). The docents were either unable to answer or radioed in to their superiors and then explained that the letters were acronyms for “The Human Race” and “Down For Whatever,” but the significance of the letters is much more important than the meaning. DFW, CBT, and THR are graffiti crews that McGee is affiliated with. McGee is repping his crews in his own way, now that he has the attention of museum-goes and does not have the freedom to go out writing graffiti as much as he once did. Of course volunteer docents cannot be expected to know everything about every exhibition, but if McGee’s show has meaning beyond “these are some cool drawings I did,” it has to do with graffiti’s relationship to the museum and the community spirit of graffiti versus the one-man genius model of the museum. McGee is subversive to a point that he probably gets in his own way sometimes. He is clearly uncomfortable in galleries and museums, even though he has exhibited his work indoors for about two decades. This discomfort about and subversion of museum norms is the hidden theme of the show, which McGee successfully sneaks into the museum. The elements of Barry McGee that McGee himself made sure were included, and a few pieces that may have been added by curators but which it seems likely McGee had a good amount of say in including, point towards his attempts to subvert the museum and their model of a one-man retrospective even when it is about his own work. 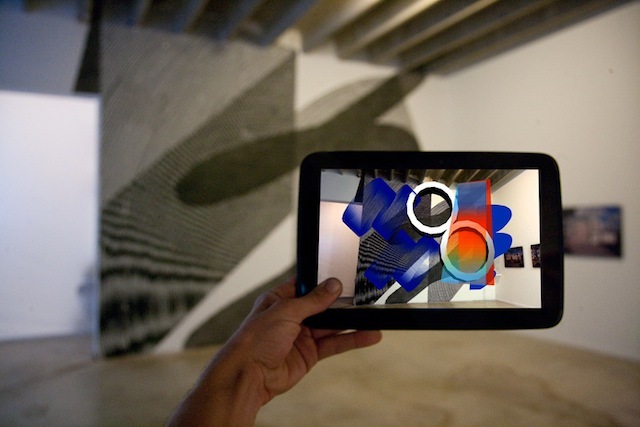 The show includes the work of at least a dozen other artists, and, in a video tour of the exhibition by curator Jenelle Porter, Porter points out that McGee’s video installation is made up of animations and video clips created and organized by McGee’s assistant Lozcano. 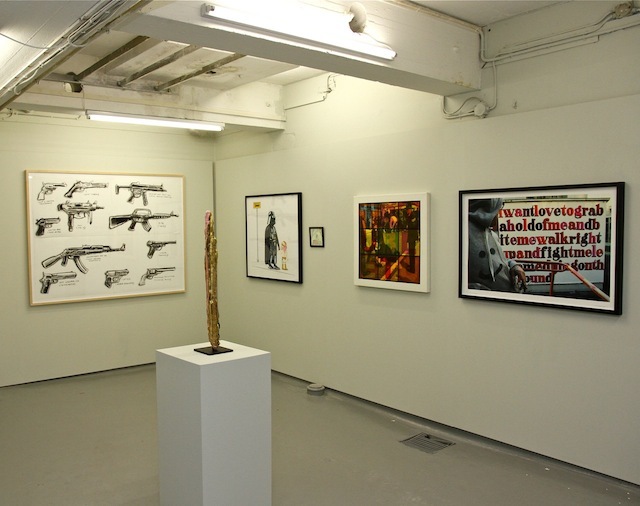 Some of the other artists whose work can be found in the show include McGee’s late wife Margaret Kilgallen, his father Jon McGee, Craig “KR” Costello, more than half a dozen freight train moniker writers, and Rize (a prominent Boston-based graffiti writer in the early to mid 1990’s and the subject of a photograph which has appeared repeatedly in McGee’s work since the mid-1990’s). 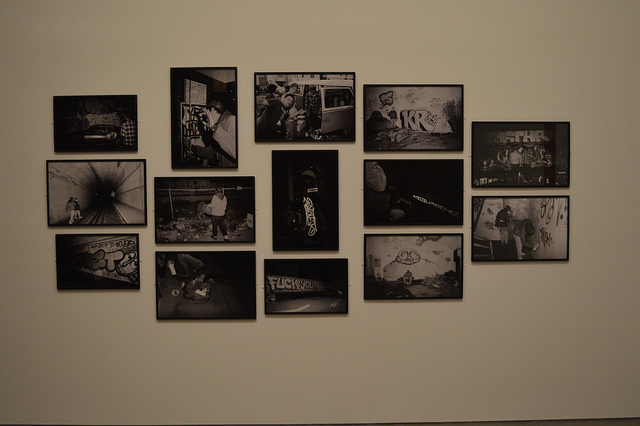 McGee even devoted an entire room of the exhibition to showing his work alongside the work his friends and legendary Boston graffiti writers who would otherwise not have had the opportunity to show inside the ICA. Lozcano’s chaotic tower videos and animations also include clips of other graffiti writers at work next to animations of McGee’s drawings, and at this point it becomes hard to say anymore exactly how many of McGee’s colleagues are represented in the show because there are dozens of video clips with fast cuts that all seem to melt together in the massive installation. Some would say that graffiti is about ego, and that can certainly be said of the upper-echelons of the art world, but McGee broke the stereotypes to subvert the museum and turn his supposed one-man retrospective into a celebration of many artists and mark-makers. Photographs by Craig “KR” Costello. Photo by Pat Falco. Outdoors, the trend of subversion of norms and inclusion/celebration of graffiti culture and community continues. Rather than putting his name (TWIST) on the wall on behind Boston’s House of Blues, we get Lozcano’s name (AMAZE) in huge letters next to an almost equally massive OKER tribute piece (OKER is currently serving time in prison in the UK for graffiti, and has painted with Lozcano and McGee before). 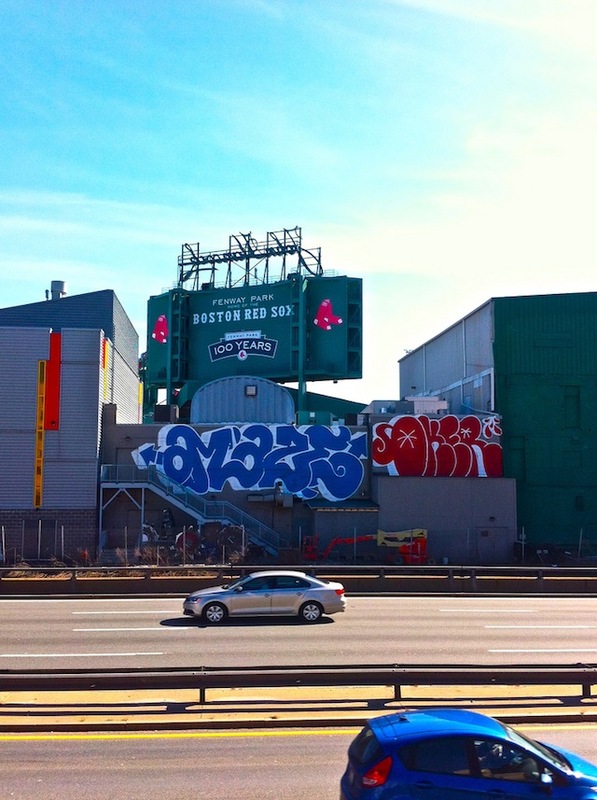 McGee put up the names of people who would better fit the wall, since the wall can be seen from the highway coming into Boston, and there is plenty of illegal graffiti to see nearby along the highway. 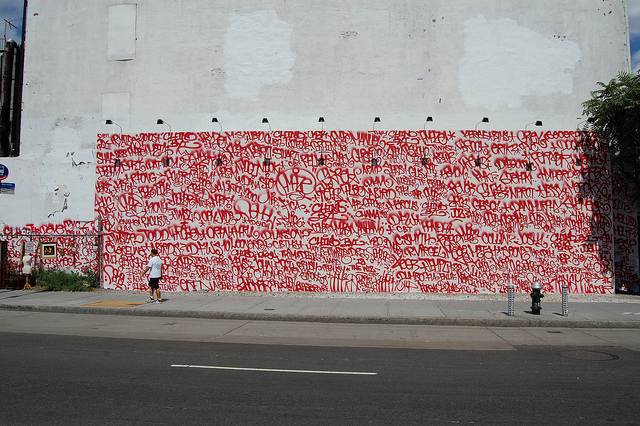 And the names were put up so that they resembled graffiti except on a massive scale and with permission, subverting the traditional expectation that a mural should look nothing like graffiti, or even cover it up. Murals like this are nothing new for McGee, but I am still explaining it in detail because it was one more subversive move to highlight more authentic graffiti and shine a light on a couple of the deserving artists whom the ICA would otherwise ignore or not be aware of at all. So is McGee successful in his efforts? Yes and no. He is successful in bringing those close to him into the museum along with him, but what is less clear is whether or not anyone has noticed. 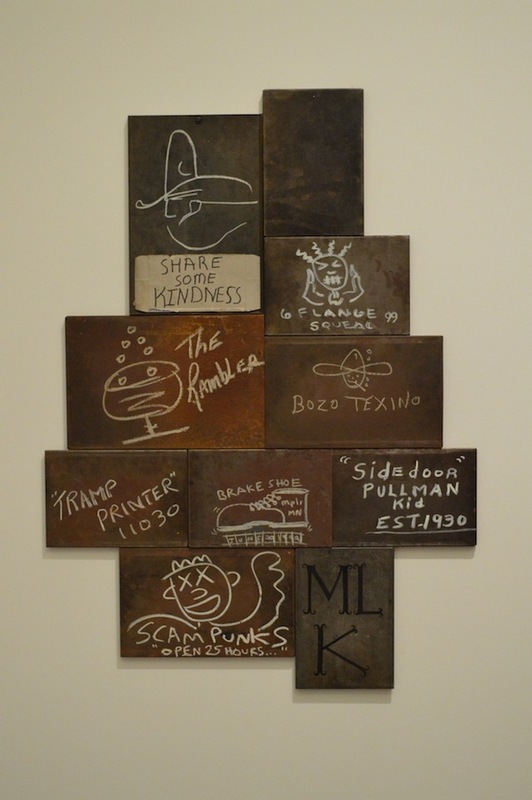 Given Valentine’s review of Barry McGee in Berkley and questions by visitors that went unanswered or poorly answered, it seems that McGee has only succeeded half way. Has anyone who was not already in on it has noticed his subversion? If you do not already know what DFW and THR mean, you probably are not going to discover their meaning by staring at one of McGee’s paintings. 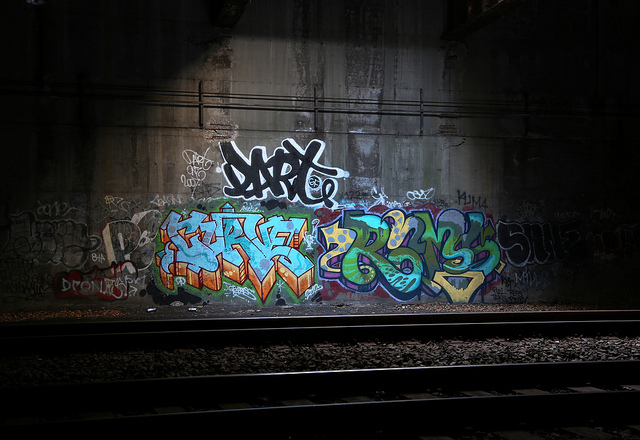 On the other hand, those who have been included seem happy, and the irony of OKER’s name being included in such a respectful way on a legal wall while he sits in prison for illegal graffiti is likely to be appreciated by the graffiti community. So maybe McGee’s subversion is a sort of secret subversion. For those who know, the show is bit of a coup. For those who do not know, things are business as usual, and that’s fine. Barry McGee is the ICA/Boston’s fourth time bringing someone from the street art or graffiti world into their museum, and of the other attempts I have seen (with the work of Os Gemeos and Swoon) it is the most successful. Barry McGee is full of strong work, it provides a good introduction to McGee without being repetitive, and McGee still manages to let his true self shine through by subverting the museum’s goals somewhat and turning the show into a show about real graffiti and community, if you are in the know. At the same time, I fear that the ICA has missed the point of their own show and failed to see McGee’s true brilliance, so the success seems somewhat accidental. For more photographs of the show, check out Brooklyn Street Art (who seem to agree that this show is really about community) and Arrested Motion. 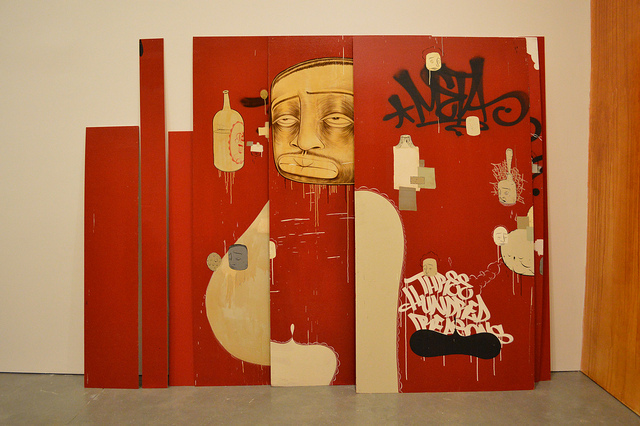 Remember the retrospective of the fantastic Barry McGee last year in California? 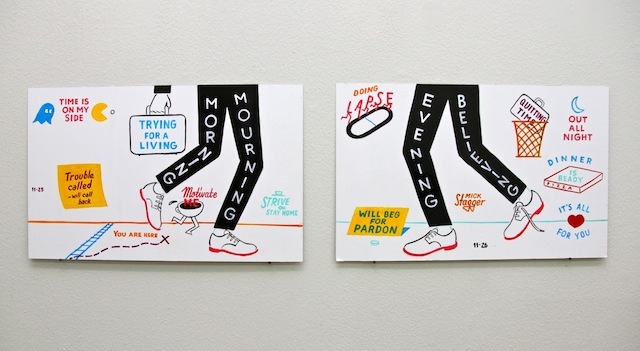 Exciting news: That show is headed to the ICA Boston next month. 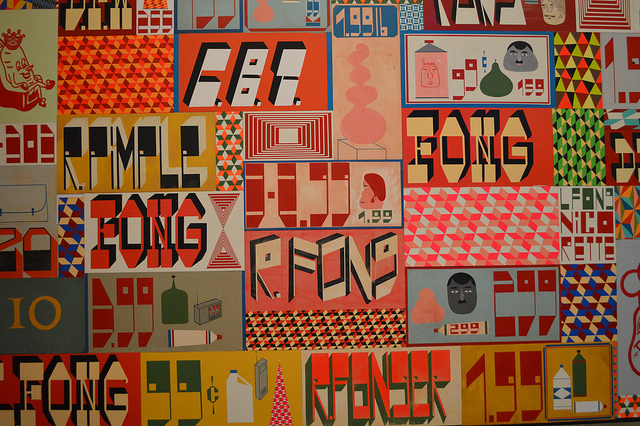 The show, simply titled Barry McGee, runs April 6th-September 2nd. Last year’s Os Gemeos show at the ICA was great, but it was small if you don’t include their outdoor work. This McGee show won’t be small, and it covers his work from the early 90’s through to today. Not much else to say yet except that you should see this one if it’s at all possible. As I’ve been gearing up for midterms, I’ve missed posting some great outdoor work (and other things) this week. Does the buffman have a sense of humor or did mobstr do this himself? 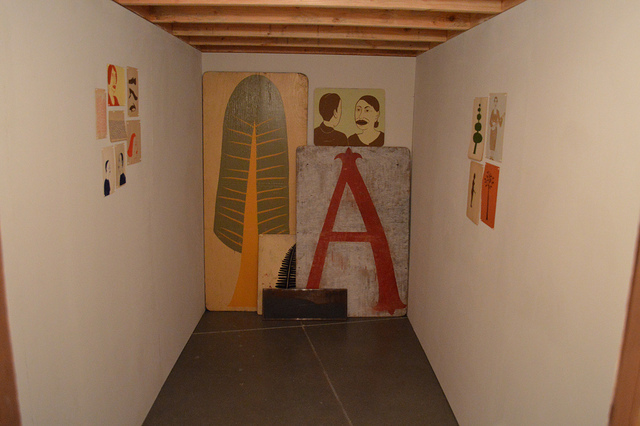 Barry McGee, Chris Johanson, & Laurie Reid showing together in SF. You may have seen the video of Margaret Kilgallen on Art21 before, but here’s some previously unseen footage of her and Barry McGee from that shoot. I love this piece by Disk. And also this one by the highly underrated Ludvig. 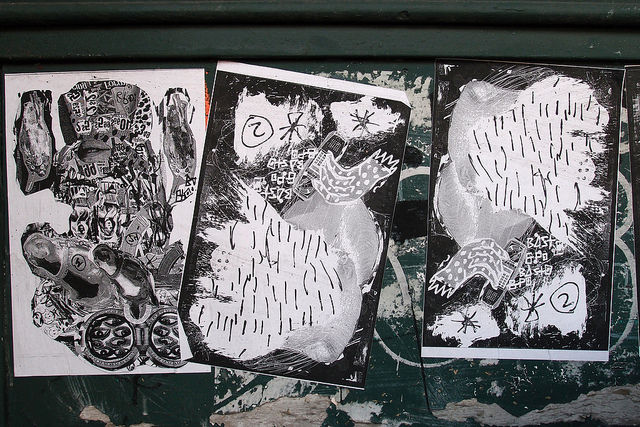 There’s a fundraiser to benefit Essam, the artist who was beyond those brilliant drone strike posters and then subsequently arrested, taking place later this month. Graffiti geeks will love this tattoo flash. 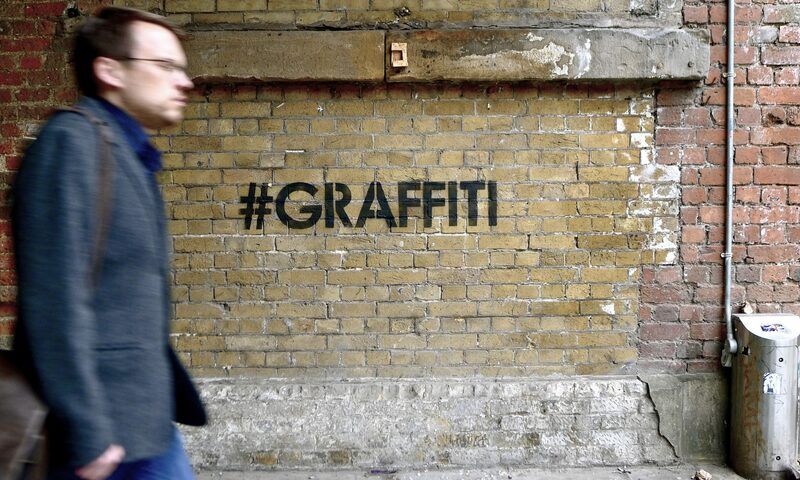 Jack Murray aka Panik ATG has written a must-read post about some historic London graffiti on The Foundry being covered by a street-art-emulating ad for Microsoft’s Surface. Hopefully somebody once again uses that surface for something creative very soon. Ron English has a new colorway of his Temper Tot art toy for sale exclusively on his website. I’m not quite sure what has happened here. First, an artist who goes by the name Edwin painted this piece in Hackney Wick. Now, it looks like this. It seems to me that Sweet Toof went up and added his teeth to the piece as a subtle diss to Edwin for ripping off Lenny The High Roller, the character that Sweet Toof and Cyclops used to paint back when their Burning Candy crew really dominated Hackney Wick. Yes, lots of street artists paint skulls and graffiti writers paint skulls, but the similarities here, particularly the eyes and given the location, are too much to ignore as mere coincidence. Also, this might be a stretch, but the hands in Edwin’s piece kinda look like Gold Peg’s hands (who also painted with Burning Candy in Hackney Wick and elsewhere). This film about M. Chat is screening in Philadelphia next week at the Slought Foundation. Strange thing though. The description of the film actually never gives the name of the artist, but M. Chat has a Wikipedia article and a Twitter account and shows work in galleries. Additionally, the Slought Foundation has posted downloadable templates of M. Chat’s work for people to customize and put up on their own. I called up the Slought Foundation and was told that Thoma Vuille, the man who it seems was behind M. Chat, is not involved in the show, although the man I spoke with suggested that the M. Chat logo may have been painted by a collective rather than just one man (like The Toasters collective with one logo and multiple members). 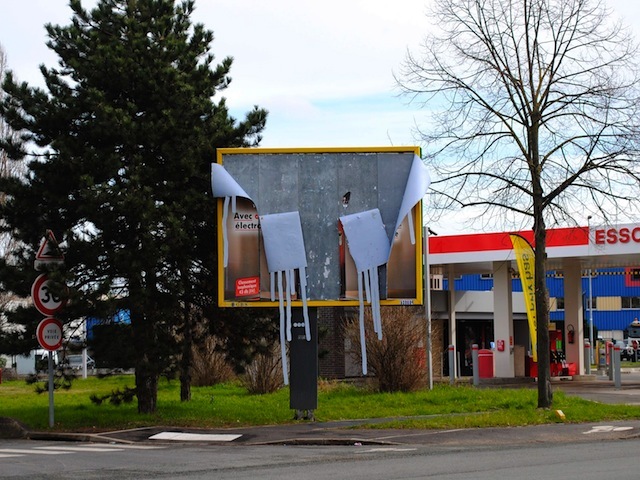 So, is this appropriation of an unexplained urban mystery or theft an artist’s creation? I’m not one for strict copyright laws, but it does seem to me like the moral thing to do here would be to at least give some credit to Vuille aka M. Chat rather than pretend that the cat is still a complete mystery. KATSU’s April Fools prank is a bit early, but still pretty funny. 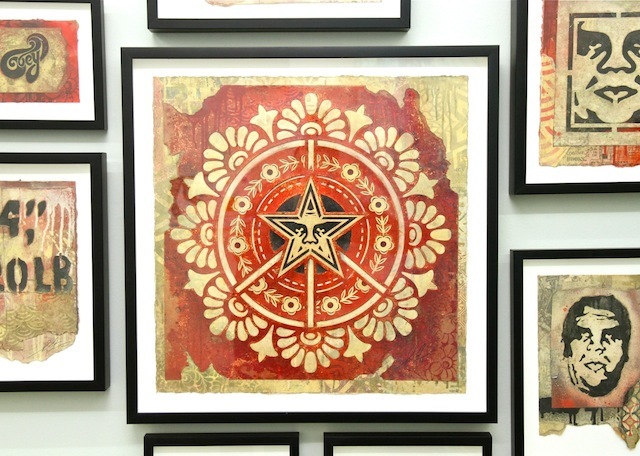 The Outsiders / Lazarides has some really nice prints by Ron English. They are variations on his Figment image, aka Andy Warhol wig and a skull. 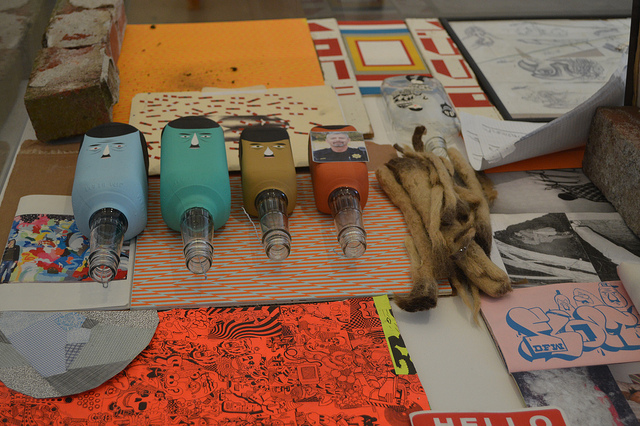 Barry McGee, Chris Johanson and Laurie Reid are showing together at City College and SF starting today. Here’s a new piece from the always-interesting 0331c, but if you don’t know 0331c’s work, here’s an introduction. Nychos x Jeff Soto = Yes! New work from Isaac Cordal. Woah. Nice work from How and Nosm in San Fransisco. Jonathan Jones is up to his old tricks of dissing Banksy to get more hits for his column, and I’m biting. He writes, “Banksy, as an artist, stops existing when there is no news about him.” Even if that is the case, is that the end of the world? 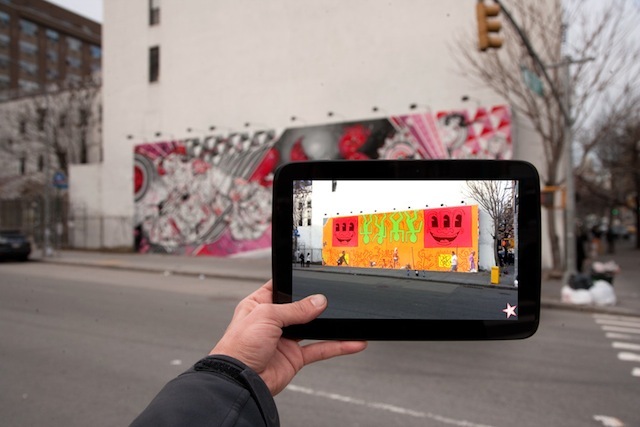 Does that relegate Banksy to “art-lite”? No. Banksy is one of the most talked-about artists in the world. I would bet that the same criticism was leveled against Warhol, who I believe Jones likes. Banksy’s manipulation of the media, playing it like a damn violin sometimes, is some of his greatest artwork of all. He manipulates the media to spread a message. 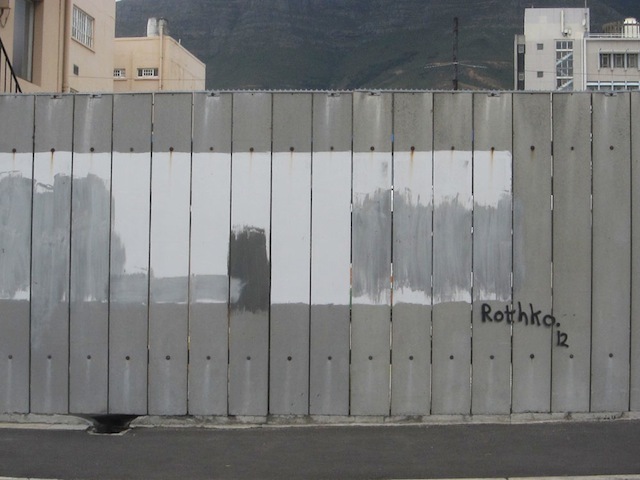 The best example of this was probably him going to Bethlehem to paint on the separation wall because he knew that the media would cover it. He was able to play the media to draw attention to an issue that he felt strongly about. Banksy’s paintings are sometimes great and sometimes not. But his ability to make people fascinated with him and his paintings is just as much of an art, and that shouldn’t discredit him. V1 Gallery in Denmark celebrates its 10th year with Tonight We Won’t Be Bored; a massive show of 100 new works by artists like André, Kenny Scharff, Futura, Faile, Lydia Fong (aka Barry McGee), Barbara Kruger, Shepard Fairey, Steve Powers, Todd James, Andrew Schoultz, Thomas Campbell, Erik Parker, André, Neckface, Eine, Wes Lang, Clayton Brothers, and many others. The show opened on November 30th and runs through January 12th. The Copenhagen gallery got its start in 2002, in a space which had formerly been used as a bakery. 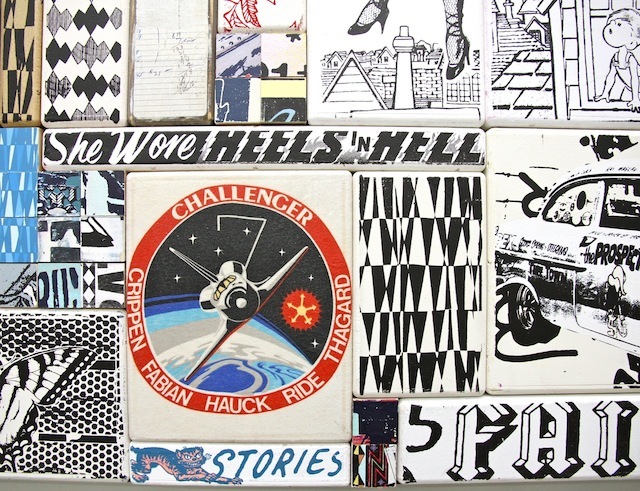 With their first exhibition being with Faile, they got the ball rolling pretty quick. 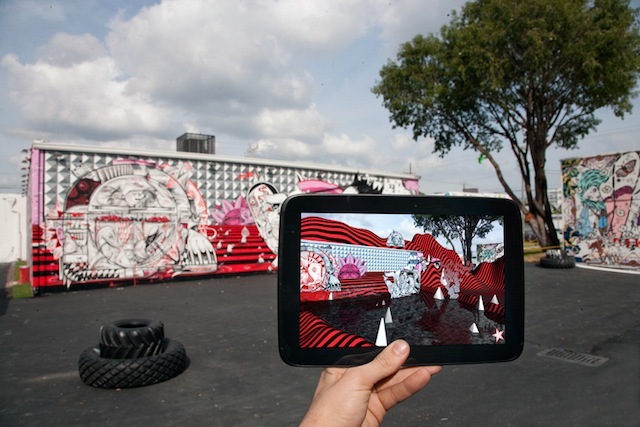 By 2007 they moved to a larger space and later started curating shows and participating in art fairs around the world. Bonhams is holding an Urban Art auction in LA (Christ, 5 years after I first heard it and I still hate that term). This has been going on in England for years and of course Doyles New York just did something similar in NYC, but this is the first time Bonhams is doing an Urban Art auction in the USA. Notable lots include this absolutely classic Banksy, some very expensive kindling, an alright Shepard Fairey (a bit special since his originals don’t go to auction often), a Calvin Klein ad by KAWS, a nice Barry McGee panel from 1996, another nice Banksy, one of Chaz Bojórquez’ Señor Suerte stencils on canvas, and a large COST and REVS collaboration from the early 1990’s (yes, its legit, and yes, I would like to hang it in my dorm room if anyone feels like gifting me $20,000). Caleb Neelon recently painted some work in Turkey. Butterfly and Opera Gallery London have teamed up for a show of 33 artists including Sweet Toof, El Mac, Roa, Shepard Fairey, Ron English and many more. It opens next month.